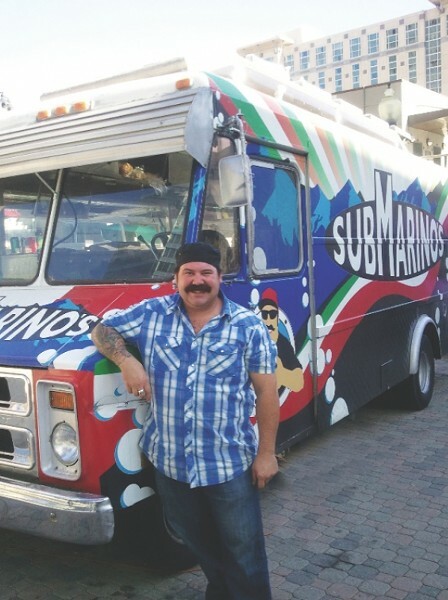 Tony Marino, co-owner of the Submarinos food truck. But, thankfully, there are some places where you know you can find certain trucks on a regular basis: The Chow Truck can often be found at 9th & 9th in the afternoons and evenings; Better Burger has a presence at Red Moose Coffee on 1700 S. 900 East on evenings during the warmer months; and Gravy Train Poutinerie catches the office lunch crowd a couple of times per week at 120 S. Main. But the best time and place to catch the food trucks is Thursday—every Thursday—at Gallivan Plaza from 11 a.m. to 2 p.m. You can pick and choose from a bevy of trucks, all within a few feet of one another—no spending money on gas to get an appetizer at one truck, a main course at another and finally dessert at a different truck. OK, maybe that is just me, but you get my drift. Current participants include Wilma’s Gourmet Food, Submarino’s, Grub Truck, A Guy & His Wife Grilled Cheese, Gravy Train Poutinerie, Chow Truck and Off the Grid SLC. An updated roster for each week can be found at Facebook.com/FoodTruckThursdays. If Thursdays aren’t your bag, a couple of proprietors have been working on an unofficial Liberty Park food truck pavilion. Randy and Tony from Submarino’s and Prescott from Gravy Train are gathering a couple of times a week at a former gas station lot kitty-corner from the northwest section of Liberty Park. The schedule isn’t concrete yet, but it’s a chance to enjoy the park, have some great food and encourage more trucks to join in.